Ah, no: I am going to make you wait a little. Boy have I been busy. And so has Elaine, my wonderful partner in crime aka she with the bionic stitching fingers! A while ago I took part in the Creative Craft blog tour. As part of that I was lucky to be partnered with Tracy from Glasspirations for a winter exchange. I sent her the Christmas Tree table topper and look at what I received back! I am a little late showing it because I just couldn't bring myself to open it. It was packaged so beautifully! I almost forgot my October page for my Needlework Masters book, so out came Boo-tiful in Black and I added some free hand embroidery (ahem: backstitch) and some mega french knots (four threads) and voila: I got me some spiders...cross stitch and embroidery. And it was pure un-adultarated fun! Playing..just as craft should be! The trim is from Nancy's Gingerbread Trim pack...see, I wasn't kidding about loving that set! So is the little heart button. The ghost button is one I have had for years..I'm so glad I didn't throw it away! You can't really see the spiders properly on the photo but apparently they seriously creeped my daughter out..they really stand out and look 3-d. I've found the needlework book very therapeutic: I went from January where I was looking to leave something to my family should the cancer come back to October, the fourth of my own designs going in. What a journey! Glad to be at this end of it though! 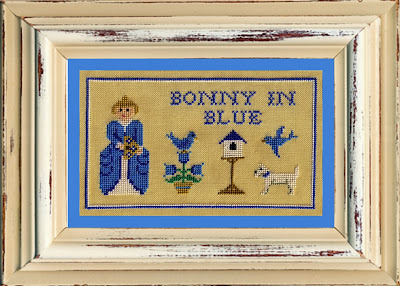 Please say hello to 'Bonny in Blue'. I think I had a competition to name this one but I can't remember any of the details so will have something to announce in a few weeks or so. The next miss wants a cat: I am ignoring her and hoping she will go away! I have one more Christmas one to come out but am waiting for the fabric to arrive. Oh, and the revised Miss. Primrose is waiting for her 'coming out' opportunity but she will just have to wait a little longer. I have been oh so busy: I've been playing with hessian and with gesso (great combination) and getting ever so messy but that is how I play work. So there will be some Christmas gifty things to show you soon. The next installment of the SAL will probably be released on Sunday rather than Saturday. I am having far to much fun time working to stitch on it and would hate to get gesso on it...that would be pushing 'creative invention' a little too far even for me! Love your October page! 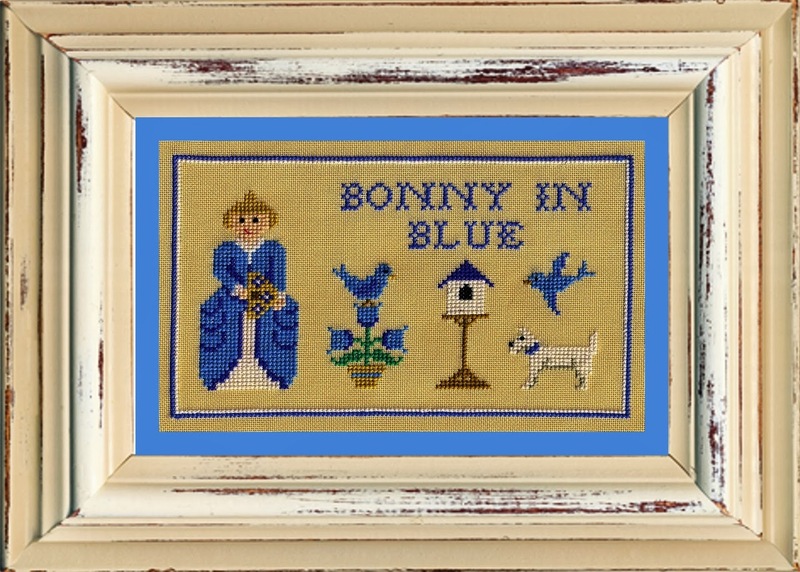 And Bonny is beautiful ~ love the pup! Well done on all you pages in the book, it'll be lovely to look back on in years to come. Will you be doing another one?